To preface this entire post, I've got a friend that is just crazy about Trance music. Most of the time when I'm talking to him, all the names of the artists pretty much go over my head. There is one name that he mentioned so often that it pretty much stuck. The one, the only Tiesto. Arguably the top dance/electronica/(or some other subgenre) DJ in the world. Actually, the main reason being it's an instore at HMV and it was free, but I digress. In retrospect, the whole situation seemed a little ill planned considering Tiesto was to spin at a 10,000 seat venue later that night, but first doing a small instore for probably a maximum of a tenth of that. The lineup for the instore began several hours before the set even took place, with wristbands being handed out around 11 am or so. By the time the show started, it was already dark and the lines were stretching around the HMV building. Tiesto's 4 CD turn tables were set up in the corner of the store closest to the busy Robson and Burrard intersection. The whole store, inside and outside, was jam packed. After a half hour delay, the 30-45 minute set began. Not surprising, the set was intensely loud and the crowd was super into it. There were certain points of the set when I thought they'd have to shut it down due to capacity limits. 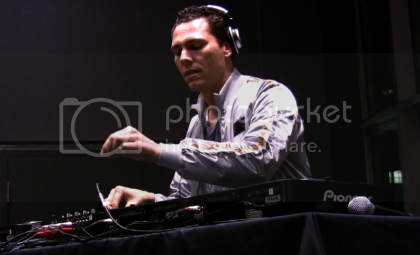 In terms of performance, Tiesto's choice of music was certainly catchy and crowd pleasing. However, being the philistine of the Trance world that I am, I wasn't exactly blown away by his technical prowess on the turntables. Other than a couple of on the fly mixing, I really couldn't tell the difference from what he was doing and just pressing play. It's possible he was just saving his 'A' game for later that night, but there were times when I thought he was just phoning it in. Actually my friend who is a DJ and even a Tiesto fan remarked later that his mixing was pretty off that set. Regardless, you had to be impressed at a man who could command a packed house and make them eat out of the palm of his hand. There was definitely no shortage of charisma, theatrics and stage presence behind the decks. Like a well seasoned veteran, he seemed to know exactly how to move and what to do to keep his fans and the mini-party moving and that's all that mattered. The show billed as an early show with doors at 7, which is when I got there. Doors opened an hour later. I don't normally do this, but I actually went to the venue without a ticket thinking it would be undersold and usually tickets are cheaper at the door. This turned out to be a mistake as, the lineup for non-ticket holders had to wait until the ticket holder's line disappeared. As my luck would have it, there was a line up to get in, which I've never had to do at the Biltmore. This was probably due to most people thinking that doors were earlier. It didn't help that everyone who brought their big cold weather rain jackets had to have them coatchecked. I had a chat with Joe LoT's bassist when I got in. He said to expect a totally different show later in the evening. I shrugged it off thinking it would be just new songs. I had a chance to ask him if they ever played "2 Ships" and "Dark Nature Places" live. It looks like they did, around 2007 for a short period of time. The aforementioned songs, for those who don't know, appeared as bonus tracks on the European version of their 'Applause Boo Cheer Hiss EP', in order to bring it closer to "LP length". There's also a possibility they'll be reworked for a later LP. I think Machu Picchu is local, but I'm not quite sure. They do sound familiar, I just can't place from where. The drummer was wearing a Cobalt T-shirt. One of the guitarists, I know I've seen him before. Plus I'm pretty sure they're associated with My!Gay!Husband! somehow. I think my overall impression of them is mixed. This marks my 6th time seeing LoT in one form or another. Admittedly seeing a band this many times makes it harder and harder to leave the show impressed. Fortunately, the show was quite a departure from any of the previous shows. The Biltmore's stage has a curtain that they use to hide the change over. I never would have expected to see a fourth person on stage when they opened the curtain launched into a blistering version of Corner Phone. It took me a minute to realize that Joe was handling guitar duties and the fourth person, who turned out to be their guitar tech, covered bass. This would be the case for a couple of the songs, but most of the set they were still a trio. I should make note that Land of Talk were also using some onstage visuals as well. Most of it consisted just visual background noise, but it still upped the stage ambience of the show. The rest of the setlist varied from the usual staples to include lesser played songs such as, "Troubled" and "Corner Phone". Overall, you couldn't help but be impressed by how tight the band sounded, especially drummer Andrew Barr (which shouldn't surprise anyone seeing as how he also plays in the Slip). Towards the end of the night, frontwoman Elizabeth Powell mentioned how packed it was at the Biltmore and how there was only 120 people last time at the Media Club. Unfortuanately, judging from the crowd of disinterested clubby looking people talking behind me, I've got a feeling they were already letting people in early for the "Dance Party" after the show. Still another good night for one of Canada's best kept secrets. I've been wanting to see Ms. Spektor since I heard her first (major label) album Soviet Kitsch. A luck would have it, she wouldn't hit Vancouver until the tour afterwards. Unfortunately my school exams kept me from catching her on latter tours. I think that happened twice actually. When I found out that she would be playing at the Orpheum this time around I got excited. It's a beautiful venue and the acoustics in this building are awesome. As I entered the building I overheard someone tell their friend that when their Dad found out that the show was at the Orpheum he offered to go instead just to stare at the decor inside. Jupiter One apparently knows how to market themselves. They have a who slew of songs that appear on commercials and video games. Sadly I didn't recognize any when I was watching them. I would describe their sound as corporate indie pop rock. I kind of feel sorry for the people on the right side of the venue because the way Jupiter One was set up, they only occupied the left side of the stage. Makes, sense, it's pretty hard to move a grand piano, which was in the center of the stage. Anyways, I found the band to be pretty boring, their sound was a little to safe for my tastes. It didn't help that each member seemed to be confined by an invisible box and wouldn't move outside it until the last song, which is when they started to rock out. Like I said, I feel sorry for the members of the audience on the right side of the venue, especially in the front couple of rows. Their sight light couldn't have been that great because Regina was on the piano the majority of the time. The length of the grand piano (Steinway and Sons, if you're curious) probably would have obstructed someone's sight line. Anyways, Regina started her roughly 80 min set with "The Calculation", the first song off her new album Far (or as she would like called, Far(t), I didn't bring it up, she did..) I was actually pretty impressed with how well behaved the crowd was. Most people were refrained from talking to their neighbour and spent the night listening to the music. I guess the classiness of the Orpheum rubs off on everyone. A couple songs in, she introduced the band. There was a violin player, a cellist and none other than a certain ex Pearl Jam-mer, Matt Chamerlain on drums. I can only imagine how those previous Commodore shows were. Anyways between songs, Regina seemed humbled by the show of appreciation the crowd had for her after each song. She was taken aback, when between a song, someone yelled out if she would join them for dinner. Being too nice to decline the offer, she went into the next song. She played all the favorites from her past albums, like "Fidelity", "On the Radio" and "Apres Moi", and the majority of the new album, though I was a little surprised she didn't play "Blue Lips". For "Poor Little Rich Boy", the stage hand, brought out a wood chair and put it beside the piano. Immediately I thought there'd be a duet. Instead she was given a drum stick, which she used to perform the song's percussion while playing the piano and singing. She hits the sticks hard too, pretty sure I saw splinters flying. No wonder they were selling drumsticks at the merch table for $5 a stick. The final song of the night was a country song called "Love, You're a Whore". I don't think it was ever released, but it's a very fun song, which got everyone up on their feet and clapping. I guess you could call it a barn burner. Well, sold out Matisyahu gig in Vancouver. Who would have thought? Does Matisyahu even get airplay in Vancouver? Anyways, before the show, I was wondering who would be opening. To my surprise, it was Dub Trio. It turns out they're part of Matisyahu's backing band. Nice. Apparently people have heard of Dub Trio, or rather fans of Matisyahu have heard of Dub Trio. You'll have to forgive me I still can't believe their fanbases would overlap. Dub Trio's 45 min set was as expected, lots of time changes, spacey "dub" jams, and a whole lot of style changes. Crowd seemed to enjoy it. 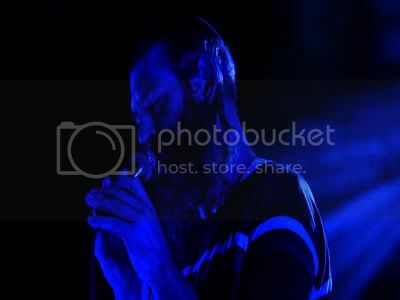 Now Matisyahu I'm familiar with mainly due to his song "King Without a Crown". When he played it, it sounded totally different. Let's call it the "Dub Trio" version. Highlight of the set was probably Matis doing a full 3-5 min of beat boxing. There were many moments in the set where Matis would just let the band jam out and he would stand by the side of the stage and take in the energy of the crowd and the music. He's probably one of their biggest fans. This was a pretty long show. It's been a while since I've seen a Commodore show go over 2 hours. Actually, if I had to mention anything negative, it would be just that. The show was almost exhausting. Almost every song approached the 10 minute mark and had a fairly loose jam integrated into it. That being said, the energy from the crowd and the strangely mesmerizing intensity coming from Matis made the show. Torngat at the Toast Collective. So who is Torngat? Well you know that band the Arcade Fire? Well they used to have a french horn player (maybe just live or on record, whatever just not a main member). Well that horn player plays in Torngat. Both bands are from Montreal. Actually, that horn player also plays in a the other Arcade Fire associated band, Bell Orchestre. 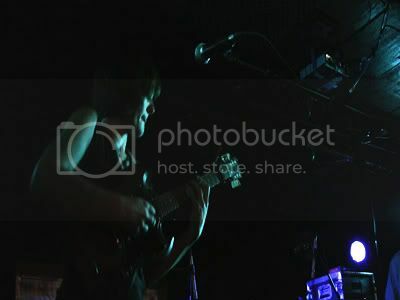 I double checked he's in those pictures I have from that Bell Orchestre show I went to in June. The other question that remains is where is Toast Collective? It appears to be a fairly new diy venue near Fraser and Kingsway (across the street from Les Faux Bourgoeis). This is probably the second most diy venue that I've ever been to. The first one being someone's living room. In fact I'd say this larger than you average person's living room. If you can picture a typical boutique store, it'd be about the same size. I did a rough count, there was about 40 people there. I'd say at least a quarter were either in the opening band or friends of. If there were any more people in the room I'd say it could get uncomfortable real quick, especially with the lack of vents and the fact that the entrance pretty much was beside the makeshift stage. All things considered, I really like this venue, it's a very small, but it's a very cozy spot. That being said I'd probably hate it if it was packed. 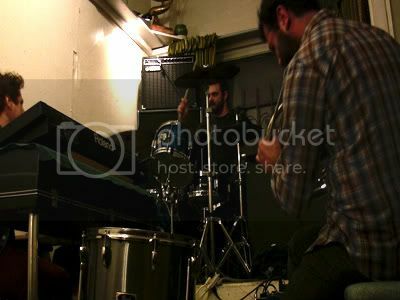 The first band was local and started with an instrumental glockenspiel/xylophone piece, which roughly lasted 12 min. Apparently this incarnation of the band isn't what they normally do, as they were billed today as acoustic (which i guess they technically were). Oh btw, the back of the venue has a living room couch setup. As it was, they played on the floor with their friends on the couches, so it was just like playing to their friends in their living room. After the 12 min, the lead singer grabbed an acoustic guitar and they played some other songs I didn't know. I think one of the xylophone guys works at the Biltmore doing sound or something. The last song was sung in Cajun French. Torngat hit the stage....well front right corner of the room shortly after. Torngat is actually just 3 guys with a whole slew of instruments and effects. I can't remember the last time I saw so much gear stuffed into one corner of the room. The majority of the set was culled from their newest album La Petite Nicole. 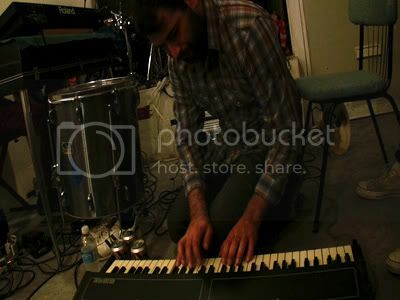 The old school analog synths which the band uses really gave their music a haunting feel to it. Their music, stage setup and instrumentation really didn't look too out of place in the very indie DIY art space. I think they'd sound pretty wicked in an old church, not that they didn't sound good here. I actually thought the drums would drown everything out, but nope, you could hear everything ok. Their set was a little under an hour, no encore. Probably didn't need one, I think most people were just as happy hanging out with the band afterwards. 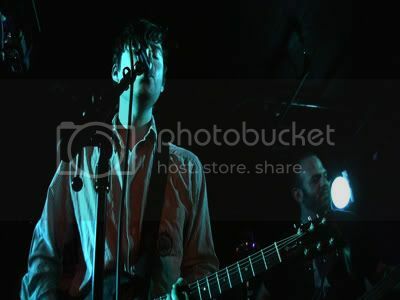 more photos from the promoter's website here.